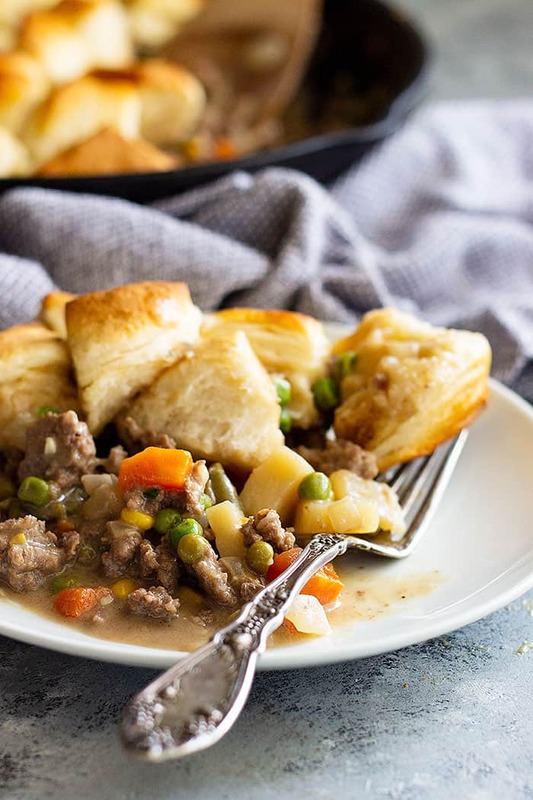 This Skillet Beef Pot Pie Recipe is the ultimate comfort food! 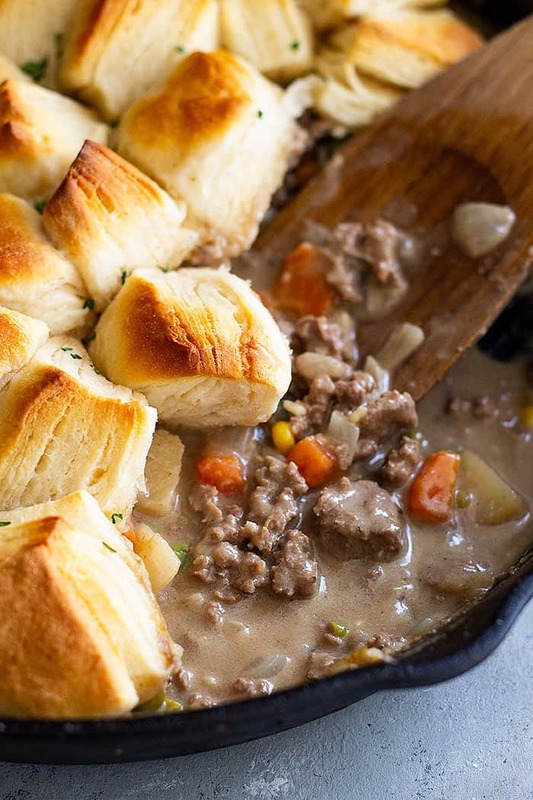 It’s filled with ground beef and vegetables in an easy to make homemade gravy. 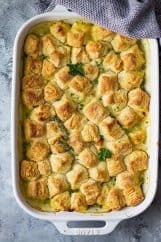 Top with homemade or store bought biscuits for a meal that will please the whole family! I have an easy dinner option for all of you!! Pot pie….yes I said pot pie and it will be on your table in about 35 minutes. You don’t have to make pie crust (unless you want to 🙂 ) because we are taking a little help from the store and using canned biscuits. 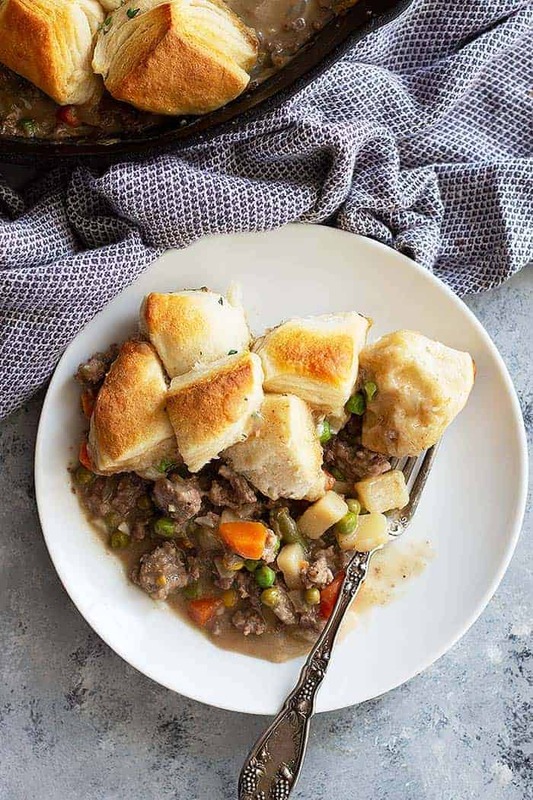 It’s filled with ground beef and vegetables in an easy homemade gravy and topped with biscuits. Plus, it’s made in one skillet! Instead of simmering tougher cuts of meat like traditional beef pot pies let’s use ground beef which cuts down the cook time drastically! Most days I don’t have time to babysit dinner and I’m assuming you don’t either. So, easy yet comforting dishes are a must. 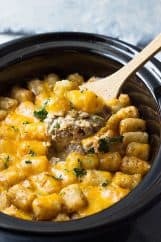 A few other easy comforting dishes you have to try are: Upside Down Pizza Casserole, Easy Taco Soup, Chile Con Queso Mac and Cheese. I have a bit of other news, if you can’t guess already :), Countryside Cravings has a fresh new face!! I am so happy with how it turned out and Lindsay Humes did an EXCELLENT job!! She was so fun to work with and full of ideas!! It was great having someone to help sort out the jumbled mess I always have going on in my head! I have so many ideas but I was never sure how to implement them. Please feel free to browse around and look everything over! And PLEASE if you have any questions about the blog and how things work feel free to ask, I would be more than happy to help you out!! I know I am probably going to be in the minority when I say this but I am so over summer!!! I am done with the 98+ degree weather every day, no rain, and how it’s been too miserable to do anything but sit in front of a fan. We FINALLY cooled off earlier this month but it was just a teaser because we are back up to 95 degrees every day! That cool week was such a nice break from the heat and it gave me that fall baking itch and wanting all the comfort foods. I’ll be honest it’s those foods I have a true passion for and find myself making them over and over. I can cook/bake them without a recipe and they are the dishes my family devours. Sure I crave a good salad every now and again but my true love is an old-fashioned Sunday dinner. It’s what I grew up eating and I know it gets a bad rap for being “unhealthy” but I’ve always believed in everything in moderation! Use any topping you desire, store-bought or homemade. Canned biscuits, pie crust, crescent dough, or even puff pastry are all great options and offer different variations. You don’t have to cut up the biscuits either. I just like too because it makes it more fun for the kids. If you use pie crust just use one crust and lay on top. Cut a couple of slits to help vent the air. If using crescent dough break dough up into the triangles and arrange on top overlapping as needed. I used 2 cans of mixed vegetables but frozen work great too. Use about 3 cups of frozen vegetables in place of the canned veggies. If you don’t have a cast iron skillet just use any oven-going skillet or baking dish. 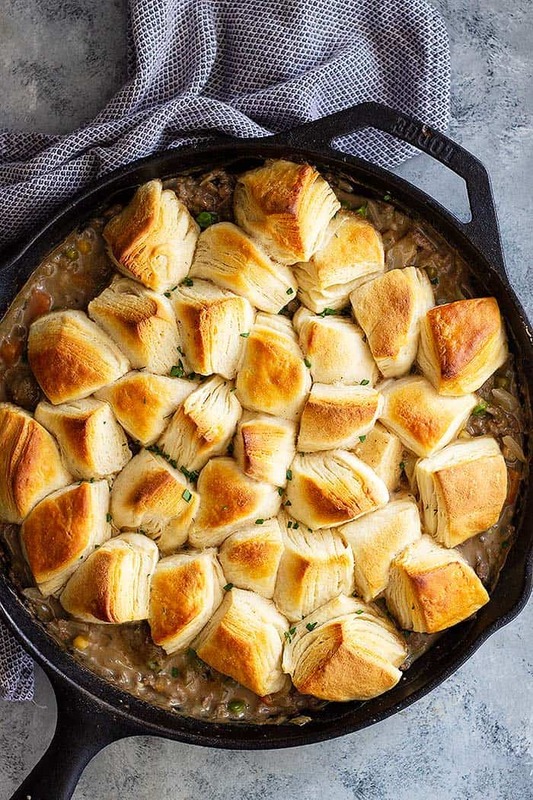 This Skillet Beef Pot Pie Recipe is the ultimate comfort food! 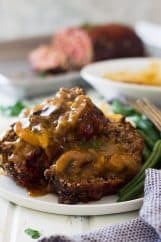 It's filled with ground beef and vegetables in an easy to make homemade gravy. Top with homemade or store bought biscuits for a meal that will please the whole family! In a large oven-going skillet brown ground beef with onion and garlic until no longer pink. Drain grease if needed. Sprinkle with flour and stir to mix well. Stir in milk, broth, and simmer until slightly thickened. Stir in vegetables. Top with biscuits and sprinkle with thyme if desired. Bake for 20 minutes or until golden. Use any topping you desire, store-bought or homemade. Canned biscuits, pie crust, crescent dough, or even puff pastry are all great options and offer different variations. You don't have to cut up the biscuits either. I just like too because it makes it more fun for the kids. If you use pie crust just use one crust and lay on top. Cut a couple of slits to help vent the air. If using crescent dough break dough up into the triangles and arrange on top overlapping as needed. I used 2 cans of mixed vegetables but frozen work great too. Use about 3 cups of frozen vegetables in place of the canned veggies. No need to thaw, just stir them in. If you don't have a cast iron skillet just use any oven-going skillet or baking dish. Nutrition Info calculated with: Lower Sodium Beef Broth, 2% milk, and store-bought refrigerated biscuits. This recipe first appeared on Julie’s Eats & Treats where I am a contributor. Sounds good. Am anxious for fall and cooler weather, too. This would be good to come home to after a football game. I agree!! Hopefully, we can cool off soon and have a nice fall instead of going straight into winter!! Thanks Grandma!! The new site is gorgeous! I tried out this easy pot pie the other night and my kids inhaled it! Thank you thank you!!! Thank you so much Julie!! I really appreciate it!! I love pot pie, usually out of the freezer, but I made this and it was SO MUCH BETTER! Plus, my husband loved it too! Thank you so much Coleen!! So glad you enjoyed it! This looks so comforting, warm and hearty! Love that you just need one skillet to make it! What a perfect fall family meal! There wouldn’t be any leftovers! Thank you! We never have any leftovers, the kid’s clean it up every time!! This was SO GOOD! 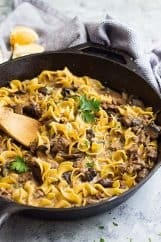 Using ground beef was a more affordable option, loved this meal! Thank you Deb, so glad you enjoyed it! !